Miroslav Brooš is an artist and teacher whose work is an ongoing dialogue between painting and textile object. Fabric brings him an experience of examining relations between art and life. An independent object such as a traditional painting is introduced into wider context of environment or installation or into the process of creation and structure of a material it is made of. 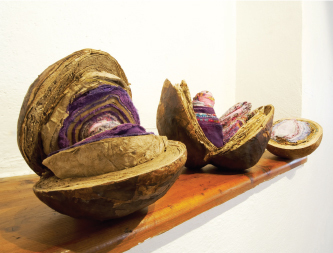 The emphasis is placed on materials (textile, paper, metal and soil) and the process of creation of an art work. Fabric is no more reduced to a painting surface. It becomes an object of weaving and stretching, of correlations between private and public. Brooš´s educational career is very closely connected to his creative endeavours. Working as an associate professor and head of object and environment studio, head of textile studio and head of paper studio at the Matej Bel University in Banská Bystrica, Brooš has inspired his students to produce many outstanding works.